How much is too much food for my cat? Although a pudgy kitty may look kind of cute, obesity is associated with cat health issues including diabetes, arthritis, and urinary tract disease. Most of us are not intentionally giving our cats more food than they need, but our pampered house cats are likely more sedentary now that they no longer need to hunt their own food. Many cats today are little couch potatoes. Their nutritional needs are much lower, so it’s easy to overfeed them. 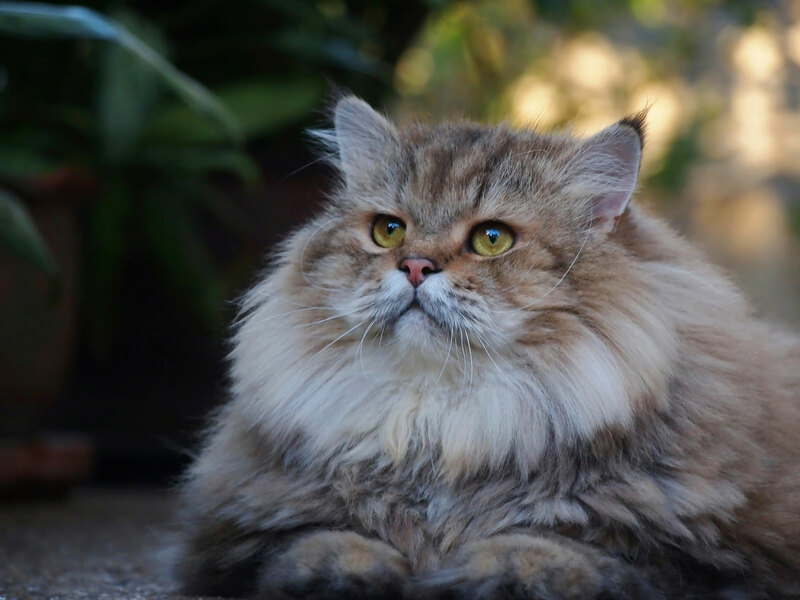 We recently wrote a blog, 5 ways to know if your cat is fat that provides some visual clues to know whether your cat is underweight, normal weight, or overweight. You can also ask your veterinarian to advise where your cat stands on the veterinary obesity scale. The only way you can possibly find out how much to feed your cat is through trial and error. To do this, you need a digital scale, a notebook, and a set of measuring cups. If you are feeding your cat dry kibble, use a measuring cup to measure your cat’s food. Measure the amount prescribed for how much he should weigh. There will also likely be a total calories amount on the package. Remember, this is the amount for an entire day, including treats. Does it look like the amount you feed your cat? If you feed your cat more (including treats) then you are may be feeding too much and your cat could be overweight. If after a week of feeding this amount (including treats) weigh your cat again. If his weight stays the same, you are feeding him an amount that is maintaining his weight. If he loses a bit of weight, and he is overweight, keep it up. If he gains weight, you’ll need to cut back a tiny bit (maybe a teaspoon at a time). Keep this up until you figure out the ideal amount for your cat. And do keep in mind that your cat’s dietary needs will change with age or exercise level. If your cat weighs less, he may have extra energy. Cats are obligate carnivores and eating kibble is not a biologically appropriate diet, because kibble is usually quite high in carbohydrates and fats. A good diet for cats consists of foods containing a maximum of 10 percent carbohydrates, but food labels will not tell you this. 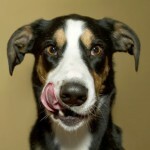 At Global Pet Foods New Brunswick, we always prefer a RAW FOOD DIET first, a high quality canned food second. This is because these diets are much closer to what a cat would eat in the wild. Also, cats need lots of moisture and prefer to get most of their moisture from the food they eat. 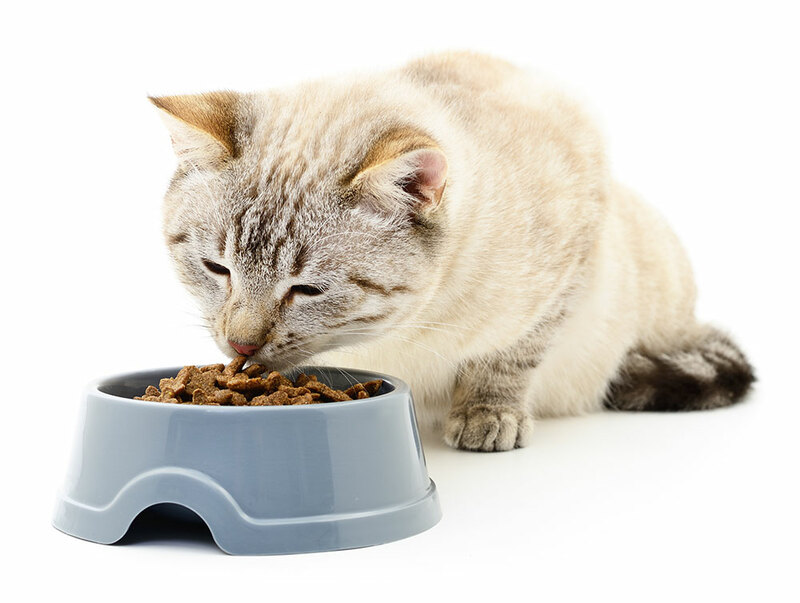 If you wish to feed your cat a dry kibble diet, we always recommend a formula that is low in carbohydrates and fats and higher in protein (the protein also helps your cat to feel fuller longer). A dry kibble diet also means it is extremely important to always have plenty of water for your cat to drink. If your cat does not drink water or gets urinary tract infections (UTIs) we can help you find a higher quality food or a supplement such as goat’s milk that will help him get the moisture he needs. For treats, consider feeding your cat freeze-dried pure meat or organ treats and make sure you count that in your cat’s total calories. We have many kinds of cat treats that are low in carbohydrates and fats that cats crave. If you have more than one cat, you may need to feed your cats separately, to prevent your weight losing kitty from horning in on your other cat. It’s actually very common for the dominant cat to be a food stealer and this could be why your cat is overweight in the first place. IF YOUR CAT IS DIETING, NEVER LET HIM LOSE MORE THAN A HALF-POUND OF WEIGHT PER MONTH! This is super important. If your cat has 10 pounds to lose, that means it must take at least 6 months for him to lose the weight. Cats who lose weight too quickly can develop a disease called hepatic lipidosis (fatty liver syndrome). You never want this to happen. Exercise — Always a great way to help your cat maintain a good weight! Adult house cats sleep about 80 percent of the day. Make your cat’s awake time a little more interesting by stimulating his prey drive. Here is a blog, Fat feline? Here’s help! with some suggestions for how to get your cat to be more active. Each Global Pet Foods New Brunswick store is a holistic pet health centre — we educate our staff about all aspects of pet health — Body / Mind / Spirit. If you have any questions, comments, or suggestions about this blog post, I’d love to hear from you. You can comment below, on Facebook, Google+ or by Tweet to Global Pet Foods New Brunswick using #GPFNB to send us a message and we’ll get back to you. You may also see your question answered in another post!